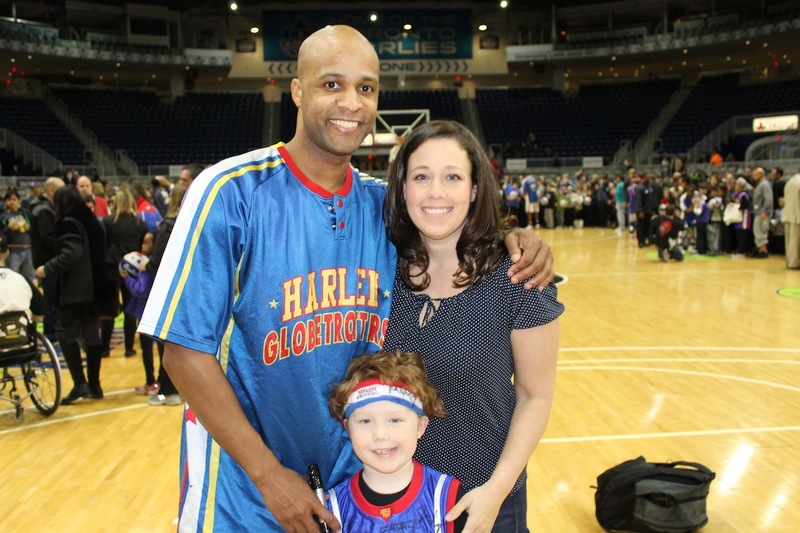 When I found out the Harlem Globetrotters were coming to the Ricoh Coliseum this weekend, I knew immediately I had to take either one or both of the kids. Due to the fact that I could only attend a night game, I chose not to bring Charlie who at 4 still has a hard time staying up late. After tonight’s game I unequivocally regret that decision. The Ricoh Coliseum is much smaller than I had imagined it to be and bringing two kids on my own would have been simple. I wondered about whether Charlie would sit through it but after having attended the game myself I know she would have love it. Will and I began the night by attending the Magic Pass session that occurs an hour and a half before each game. 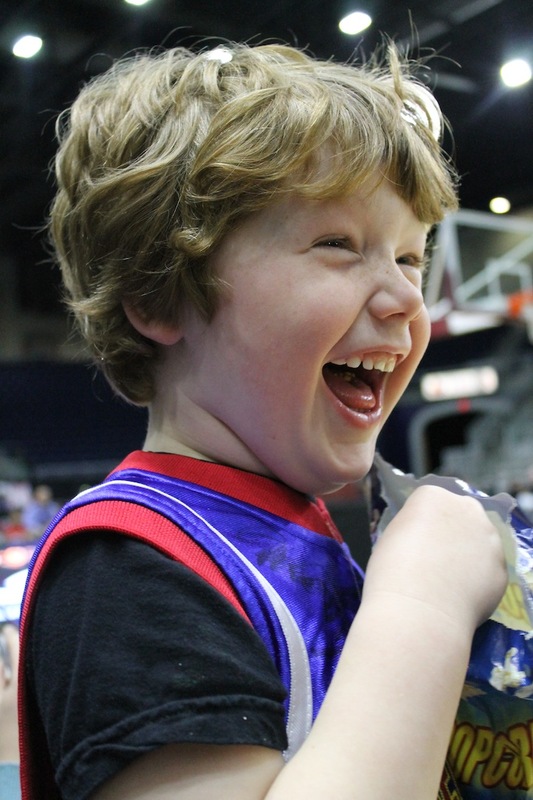 The magic pass costs an additional $25 per ticket holder and allows children and parents to interact with some of the players and Globie the mascot. The pros to paying this extra fee are that you are given early entry and you get to meet and interact with 5 or 6 players. The cons are that the session is much more formal than expected with line-ups for each activity and some of the players who attended today were not terribly good at interacting with the kids. 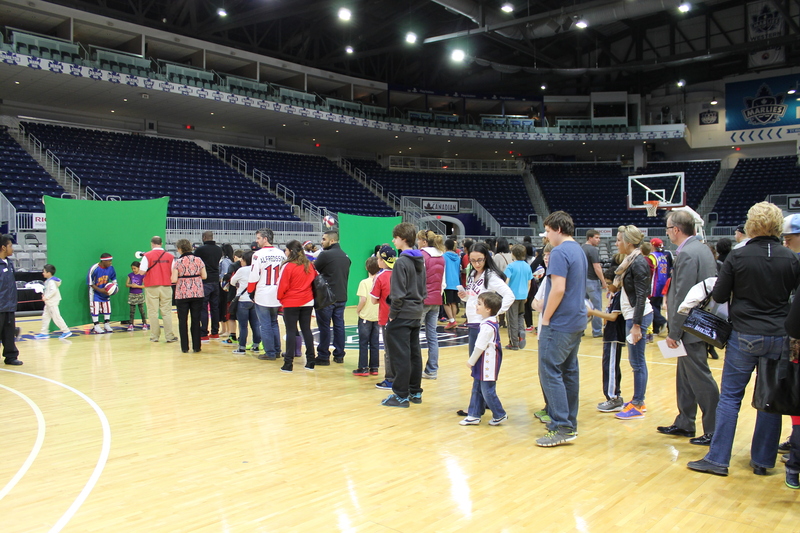 Kids and adults line up for autographs at the Magic Pass Event. We were able to meet each player and Will was able to try spinning a ball on his finger as well as attempting some shots. The two stars of today’s session were definitely “Too Tall”, the shortest player to play on the team and “T-Time” one of the only female players on the team. Both were great with kids and fun to talk to. A good reason to purchase the pass is that the children participating in the pre-game show and contests during the game are chosen from the kids who attend the Magic Pass session. Older kids were able to participate in a Dunk Contest while younger kids like Will were invited to play freeze dance in the pre-game show. Too Tall and Will spinning a basketball. Once the Magic Pass session ended, it was time for the game to begin. If you have not attended a Globetrotters game, it is much more of a show than an actual basketball game. The key thing for kids is that it is entertaining, musical, and hilarious. There were points tonight that Will was laughing so hard I was worried he might actually bust a gut. These men and women are also really good basketball players that display an incredible amount of control over a basketball. When Will wasn’t laughing hysterically, he was in awe of the amazing ball handling tricks, the cool dunks and the intricate passes. Will laughing during the game. Flight Time, Bull and Hawk pause during the game to break it down on the dance floor. 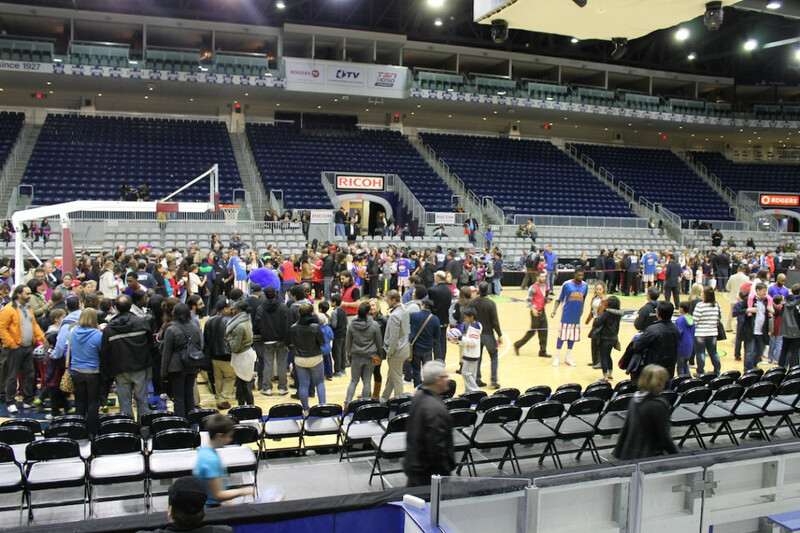 After the game, the Globetrotters stick around to meet all the fans and sign autographs. 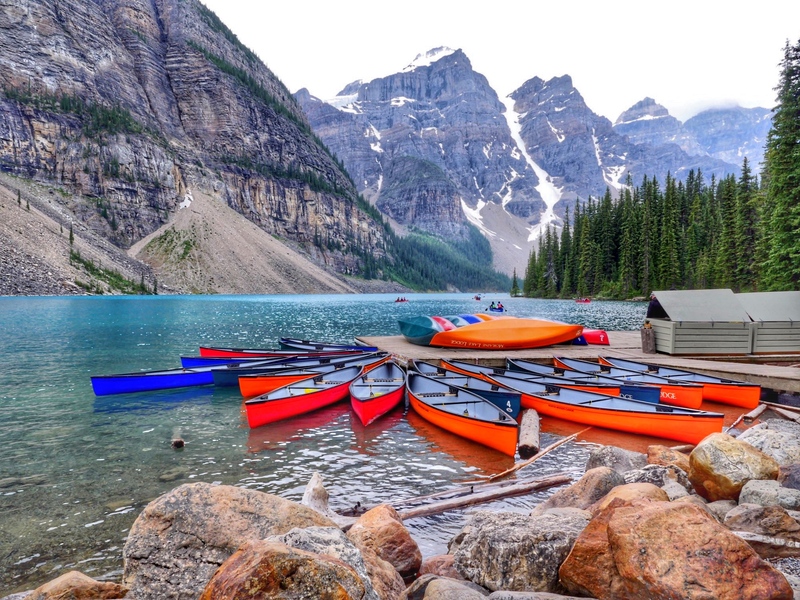 This session lasts for 30 minutes and is a great way to say hello to your favourite players. Although some players had huge line-ups, like Flight Time who is currently appearing on CBS’ Amazing Race, most were easily accessible. Flight Time very kindly took photos and said hello to everyone who stood in line for him. Due to the fact that all the players stay on the court, the lines are not as bad as you would imagine and kids really get a good chance to talk to the stars of the show. Flight Time signing autographs and taking photos with fans. The post-game autograph and photo session. 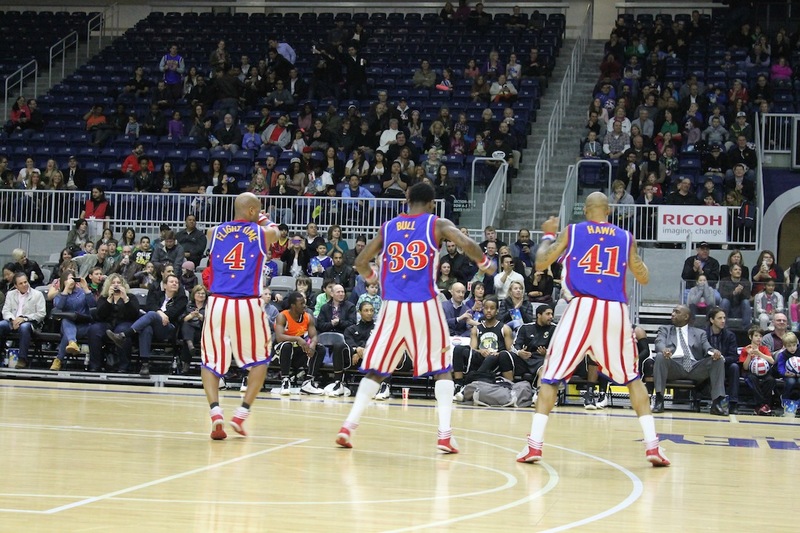 The Harlem Globetrotters play two more games at the Ricoh Coliseum on Saturday April 12th, at 2:00 pm and 7:00 pm. On Sunday April 13th, they play a 2:00pm game in Oshawa and a 7:00 pm game in London, Ontario. Tickets are still available at Ticketmaster.ca as well as the box office. Use promo code “PTPA” to get $7 off most tickets. I highly recommend taking kids of all ages to see this incredible show. I spent at least half the show watching Will instead of the game and haven’t heard him laugh quite that much over anything else before. Truly a magical night for both of us. 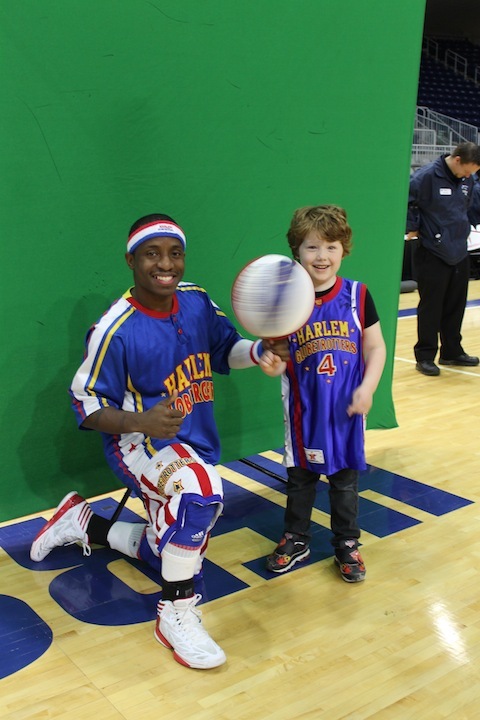 Disclaimer: We were granted back-stage access for a private meet and greet with the Harlem Globetrotters. The opinions expressed in this blog are my own.